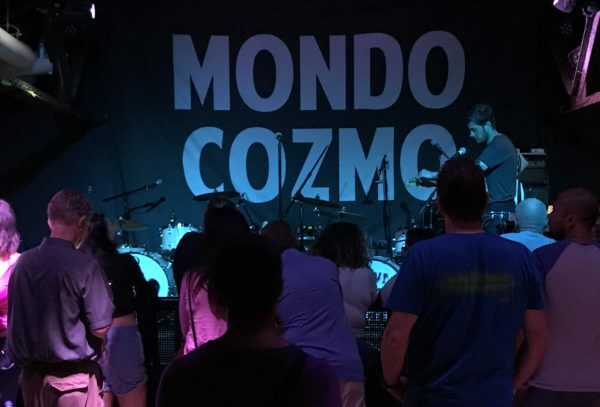 Philadelphia native, Josh Ostrander, aka, Mondo Cozmo, began his musical journey in his hometown fronting popular bands like Laguardia and Eastern Conference Champions. Both bands were signed to major labels, but fame and fortune proved elusive. Fast-forward 15 years and Josh found himself in L.A.“miserable.” While working two landscaping jobs, he would record songs in his spare bedroom. He didn’t have a record deal but he came up with a plan. That plan included calling on a famous friend for a little assistance. Faris to appear in a video for his song “Hold On to Me.” Josh made the video for “zero dollars” and used it, along with standout tunes like “Shine” to secure yet another record deal. Signing with Republic, “Shine” was released and quickly went to #1 on Billboard’s Adult Alternative chart. What followed was a mad rush to finish the full album and then TOUR! Ben and I arrived early and quickly staked out our vantage point. Leon of Athens opened the show followed by the electro-rock of ONR. Both sets were under 45 minutes and solid. At that moment, Josh, drenched in sweat, looks out adoringly at the packed house and says, “I love you.” And you know what? We believe him.